Technology touches every part of our lives: health, nutrition, transportation, medicine, social and professional networking and the list can continue. The world is changing with every innovation we embrace. No wonder that smart applications have made their way even into our bedrooms! Launched as a crowdfunding enterprise, Eight has immediately become one of the most attractive high-tech products. It consists of a smart mattress (with an incorporated sensor layer), controlled by an app. Its main traits are the dual zone warming, advanced sleep tracking and ability to connect to almost any other Wi-Fi set-up gadget in your house. The app controls each side of the bed independently, so two people sharing the same mattress will enjoy different temperatures. Also, the app can command the bedroom environment (lights, doors, music, etc.). 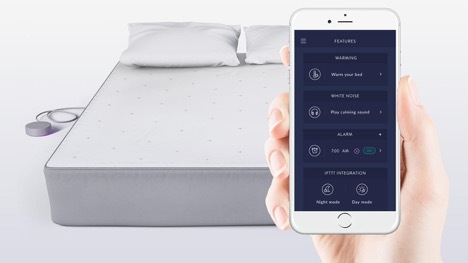 A predecessor to Eight, Luna also resides in a smart mattress cover plus an app, presenting the following features: sleep tracking; controlling the bedroom environment; turning off other devices after you fall asleep; collecting information about your sleeping patterns so you can evaluate it and make changes. The Luna app can warm up the bed before your preset bedtime and cool it down during the night, if necessary; it pitches the dual zone technology as well. The self-making bed initially presented by this company has a new and improved version: SmartDuvetBreeze. The gadget consists of a bloating air-mat that you have to put inside the duvet cover; it comes with a control box which can stay undetected under the bed. 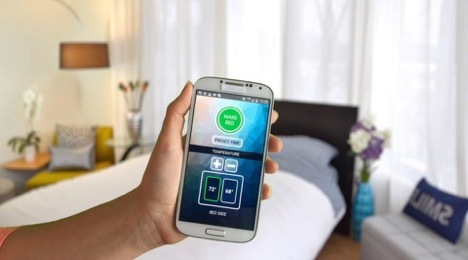 The app controls the pushing of the air into the mat and the temperature for each side of the bed; it can “order” the control box to blow warm or cold air into the duvet. Two sleepers can adjust the preferred climate on their side of the bed, at the same time. Another crowdfunded project, Balluga presents itself as the “first truly smart bed.” The app that controls it makes it possible for your bed to: monitor your body’s vital functions; adjust its firmness, support, and temperature to match your preferences (for each side of the mattress, independently). The technology is imperceptible and silent; the app is compatible with iOS and Android, but you could also handle the bed by using the wireless touchscreen control system. The smart bed also has some unique features I find surprising: the app allows you to alter the stiffness of the mattress any time you use it; it also saves your preferences, and you can use them on any other Balluga Bed anywhere in the world! Add sleep monitoring sensors, anti-snoring technology, non-allergic and antibacterial materials, plus safety, comfort and low energy consumption, and you have a state-of-the-art smart product.